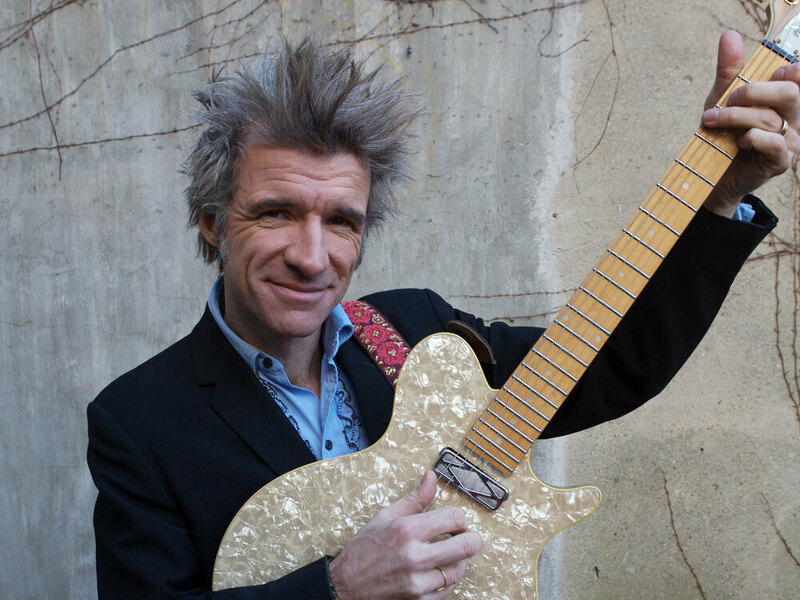 Dan Zanes is a big star in kids' music, and he's collaborated with artists as diverse as Natalie Merchant, Lou Reed and The Blind Boys of Alabama. Zanes' latest release, 76 Trombones, is a tribute to Broadway music, kid-style. On the album, he teams up with stars of the Great White Way, including Carol Channing (Hello Dolly!) and Matthew Broderick. It all started with a call from Paul McCartney's publishing company, which has music by many Broadway composers in its catalog. "Did we want to make a family CD of Broadway music?" Zanes asks. "But my manager kept saying, you know, 'Just keep thinking, keep thinking, be openminded.' And I was saying, 'You know, it's just gonna be weird folk music in the end.' And everybody said, 'No, that's fine. That's what we want. You just do your thing.' "
And Zanes — who plays guitar, banjo, mandolin and harmonica — has done just that. His new CD, 76 Trombones, features 17 showtunes, all performed in Zanes' trademark style. "I like the raggedy sound; I really do," he says. "I feel like that's our specialty. And I wanted to really try and make Broadway music for the new economy, where it just sounds like it's a little group of people who might not be all that familiar with what Broadway is. But the spirit is high, the musicianship is high, but it's not about perfection; it's all about enthusiasm." Zanes says 76 Trombones is inspired less by big show business than by little show business. "It's the shows kids put on in the living room after dinner, or it's the shows that people put on in high schools or junior highs," he says. "It's community theater. It's all the shows, large and small, that go on. It's such a huge part of life here in America." But Zanes has invited guest artists from big show business to perform on the album. "I don't know much about Broadway," Zanes says, "but I do know enough to know Carol Channing and Brian Stokes Mitchell and Matthew Broderick. And so the idea of working with those people was instantly exciting and appealing. "Carol Channing, to me, just embodies the spirit of show biz. So, in 'Hello Dolly,' we flipped the lyrics around a little bit, so that it was almost a way of celebrating her, as well as the song itself," Zanes says. Another song from Hello Dolly! got the Dan Zanes treatment, with some help from Broderick. Broderick says that when "Before the Parade Passes By" is sung in the musical, it has a completely different context. "It's about life passing you by and you gotta jump in, which doesn't resonate to a 4-year-old," he says. "So we played it more as just watching a parade — you know, that parades are fun to watch. And maybe 20 years later, a kid who listened to it will say, 'Wait a minute! I think that was about middle age or something.' "
Another song with a changed context comes from La Cage Aux Folles, where it was sung by a proud drag queen. "I go crazy for Jerry Herman songs, and the one that particularly kills me on this record is 'I Am What I Am,' " Zanes says. "For me, it just felt like the perfect campfire song, and that's how we tried to record it, as if the group was really sitting around a campfire late at night." "I always hope, with everything we do, that people hear these and they wanna go make their own music," Zanes says. "That somehow, this music is suddenly within arm's reach." Zanes says he's enjoyed recording this album of Broadway songs so much, he and his group are going to put together a live stage show, with tap-dancing and breakdancing, to showcase them.